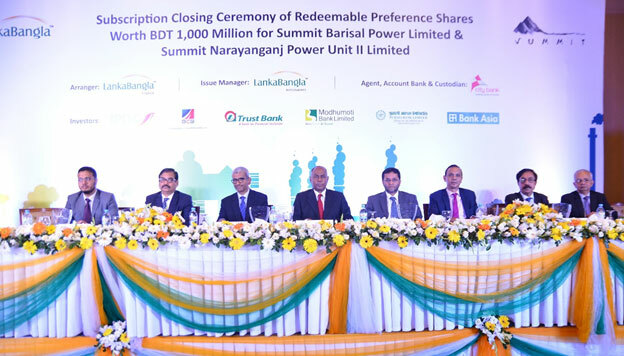 A subscription closing ceremony to raise capital through issuance of Preference Shares worth BDT 1,000 Million (USD 12.50 Million) for Summit Barishal Power Limited & Summit Narayanganj Power Unit II Limited, concerns of Summit Group was held on November 9, 2017 at Pan Pacific Sonargaon Dhaka. LankaBangla Finance Limited has acted as the Mandated Arranger, LankaBangla Investments Limited acted as the Issue Manager and The City Bank Limited acted as the Agent, Account Bank & Custodian Bank to raise the fund. In the event, Mr. Lt Gen (Retd) Engr. Abdul Wadud, Managing Director of Summit Barishal Power Limited & Summit Narayanganj Power Unit II Limited, Mr. Khwaja Shahriar, Managing Director & CEO of LankaBangla Finance Limited, Mr. Mohammed Nasir Uddin Chowdhury, Managing Director of LankaBangla Capital Market Operations, Mr. Mominul Islam, Managing Director & CEO of IPDC Finance Limited, Mr. R Q M Forkan, Managing Director & CEO of Bangladesh Commerce Bank Limited, Mr. Faruq M. Ahmed, Additional Managing Director of Trust Bank Limited, Mr. Akthar Hamid Khan, Deputy Managing Director of Pubali Bank Limited, Mr. Arif Hasan Khan, Vice President of Modhumoti Bank Limited, Mr. Mohammad Ibrahim Khalil, FCA, Vice President & CFO of Bank Asia Limited and Mr. Mahbub Jamil, Vice President and Head of Structured Finance of The City Bank Limited along with other senior officials from the companies were present.